Alison on Firestarter (V3) at Rumney. Alison Vuocolo started climbing in 2009. After countless suggestions from her boyfriend, also an incredibly talented climber, she made it to the gym to help him celebrate his birthday. She was instantly hooked on bouldering and bought both a gym membership and her first pair of climbing shoes within a week. "It's hard to put into words," Alison says, "but as soon as I started climbing, it just seemed like a necessary thing to do all the time." 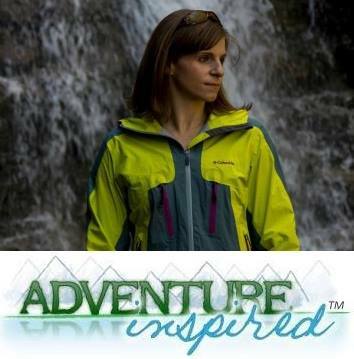 Through climbing, Alison gained self confidence she never knew she had, and a new way to engage the problem-solving part of her brain. "Climbing is the only physical activity I've ever been able to perform on pure intuition...[it] made me realize my brain has more technical capability than I ever assumed...eventually, your body learns to generate both technical and powerful moves." 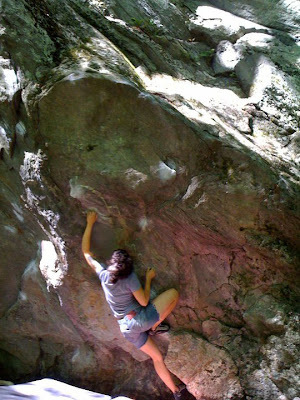 After trying out V0 boulder problems and solving them without difficulty, Alison started projecting harder climbs. 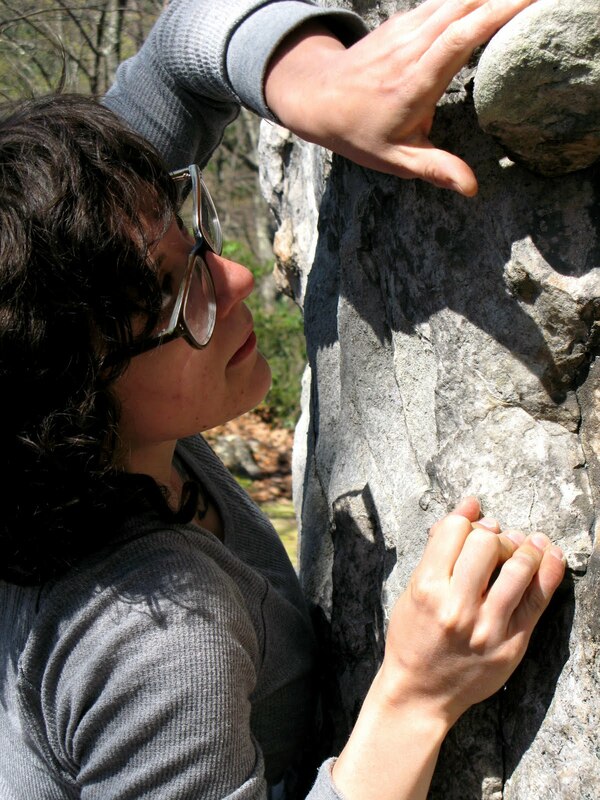 At a recent bouldering competition, she climbed a 900-point problem without any trouble. Even when some of the guys Alison boulders with tackle problems she can't, she's still confident and says, "...at the end of the day, I'm always so happy that I climb." 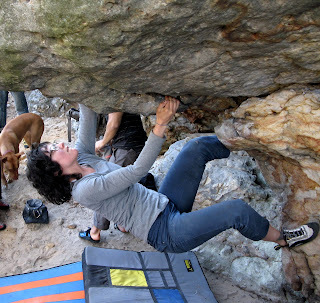 Alison noticed a lack of women boulderers at our home gym and that the super hard climbs are largely dominated by men. But instead of accepting it, she's doing something about it. 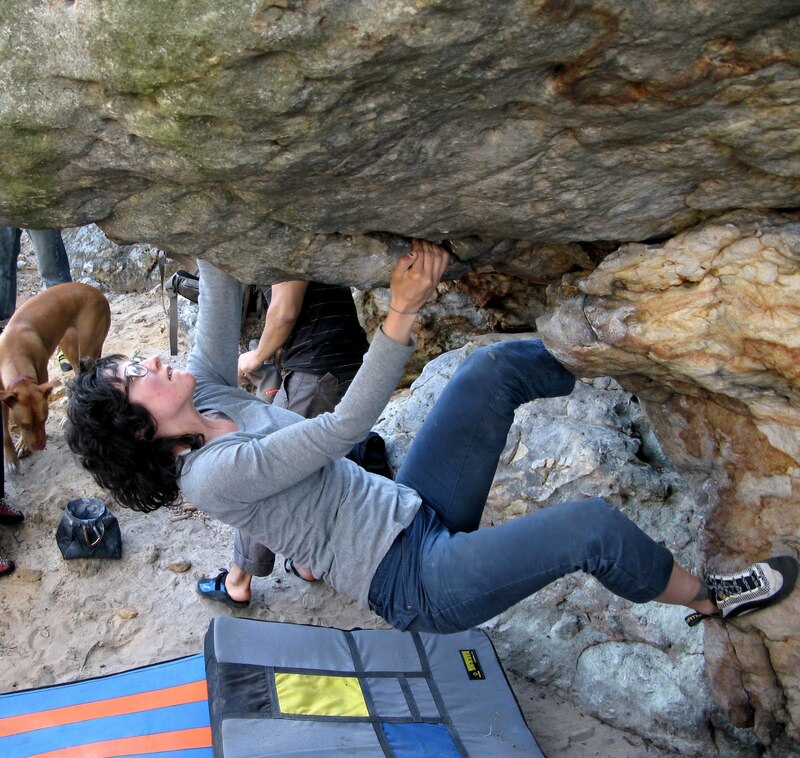 "I was inspired to create a tighter community of women boulderers when I started bouldering outside. " Alison says. "The difference in climbing technique between men and women becomes much more apparent when the problems are on real boulders where the variations in beta are much greater." Despite being one of the strongest lady boulderers I know, Alison explains she's had a tough time bouldering outdoors with men because of these variations. "They can usually get my projects in one or two goes and I end up climbing by myself or moving on." She longs for a group of girls to boulder with and has seen what having a tight knit community of lady climbers around can do for performance. "I've envied the groups of three or four girls that go together and project the same climbs. Sometimes I'll get on stuff with them, but the whole time I'm wishing that I had that same community." Alison was also inspired by discussions around Angie Payne's first female ascent of The Automator (V13). "Basically, Flannery [Shay-Nemirow] seemed to believe we would have already seen a female ascent of a V13 if the pro women climbers went on trips together more and projected things together like so many of the male pro climbers do." Alison explains. "You see a lot of videos of strong...female boulderers working their projects solo or with other male pro climbers. It's rare to see a group of strong female boulderers working these hard projects that, up until now, only have 'male beta.'" Alison rocking an unnamed route at Hunter Rocks. Alison took a huge step in helping create a community of lady boulderers in Philadelphia by working with Go Vertical general manager Kathleen Walker to set up a three part women's bouldering clinic. She's also getting teaching tips from one of the best female boulderers in the world - Alex Johnson. The first class is aimed at beginners, the second at women comfortable on slightly harder climbs and the third at all levels with the goal of designing bouldering sessions for progression in climbing. From how to read problems to warming up, from static to dynamic movement, from finding weaknesses to projecting climbs and everything in between, Alison is sharing her expertise with the goal of getting more women out bouldering. By hosting this clinic, she hopes that participants start establishing "their own female-oriented climbing circles. It not only helps make things more comfortable and less frustrating, but also relieves some of the more counter productive female competitiveness too." The first clinic of the three part series takes place this Friday, April 22nd at Go Vertical. But if you're not signed up already, it's a bit too late; all three sessions filled up in less than two days. To me, that speaks volumes. When asked why she thinks the clinic filled up so quickly, Alison explains, "I had this feeling that a lot of women are just psyched out about bouldering by themselves. I sort of knew this might happen." Hopefully, it will mean a second series of clinics and more women on the bouldering wall at our gym, then eventually, more local women bouldering outside! Bottom line - women aren’t staying away from the bouldering wall for lack of interest. So then, what is it? Is there a lack of opportunity for women to get involved in bouldering? Yes, yes, yes! Thank you Alison for stepping up and putting all the work into getting a stronger community of women bouldering together. As we wholeheartedly believe, women climbing together are not only super supportive of each other, but great at pushing each other and getting the beta most useful to us finishing a problem. Can't wait to follow the progress of your clinic and efforts! Thank you too Katie for sharing this story! Katie - great post. And to Alison - hooray! and thank you for putting together such a much-needed clinic for women (kinda makes me want to move to Philly right now!). I'd love to see a follow-up piece on the clinics and what the participants experienced (their thoughts and whether they feel more motivated to get out and climb together). I love this!